According to Gallup, 85% of employees in 2018 say they aren’t really engaged at their office. As an HR department, you have a responsibility to impart important information to your employees. Getting that information to impact unengaged employees is an extremely difficult task. Not only can you improve the impact of your communications for 2018, you can improve employee engagement with texting! Employees shouldn’t feel as if their time is being wasted with benefit information, excess paperwork, pointless meetings or long training sessions. Keep your messages short. Communication that is direct and clear will help employees pay attention and remember key points. 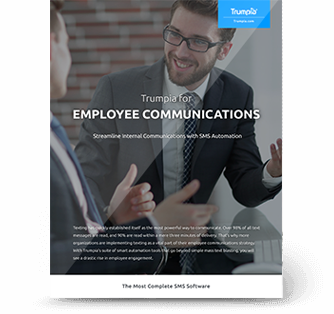 Improve HR communications efficiently with SMS. Text messaging is a great way to send short but impactful messages, since you will have to trim each message to 160 characters. Use surveys to gather valuable feedback from your team. Employees that help build the company are going to be more engaged and feel more personal responsibility in the outcome. Let your employees have a voice that directly impacts the company by texting them polls and surveys about your policies, practices and events. The more an employee feels plugged in to the process, the more loyal he or she will be. You want to create employee advocates that are excited about your brand and spread a positive word to their friends, family, peers and acquaintances. The more people your employees tell about your company, the more your organic reach will increase for both potential customers and top talent for new hires. Engagement numbers often drop, the longer employees have been with your company. Gallup reported that only 5% of employees are engaged after 10+ years with a company. Talented and seasoned employees are the most expensive to replace, so improve long-term employee engagement with texting. Make sure you have training in place that is direct and built for the employees who are already well versed in your company policies. Don’t waste the time of your seasoned employees, but make sure they also have room to grow further as professionals in your company. Employees that are able to see a healthy career path are going to be more excited about the direction of their role as a professional in the company. Text messaging can be used to get feedback from these employees, remind them of professional opportunities and check in on training retention after an advanced session. The things you offer your employees outside of standard pay are going to motivate them to remain excited about your company. When benefits change, text team members with key facts that will encourage them to click on a shortened link, texted to provide to additional content. Allow employees to check in on how many vacation days or sick days they have left by texting in for a personalized, automated response. 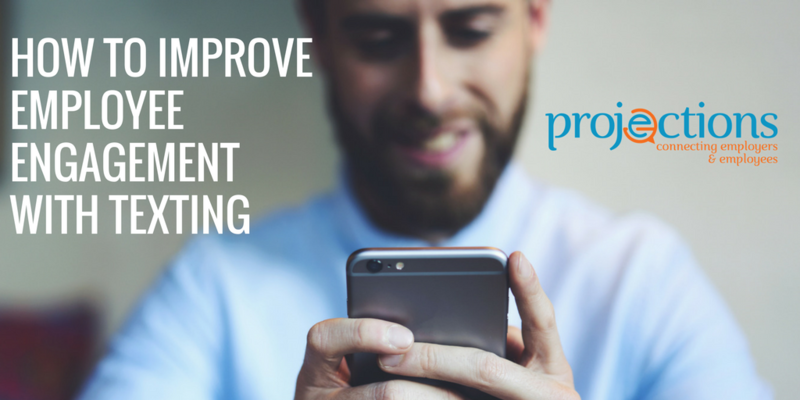 Improve employee engagement with texting by promoting office contests. Employees can even be awarded prizes for being the first to text back a response to a trivia question about policy, get perfect “attendance” in responding to HR surveys or have their name drawn from a number of correct responses to training quiz questions. Use creative strategies and text messaging to get your employees more engaged in the workplace. Look for ways to make employees feel needed and empowered on a daily basis, and improve employee engagement with texting. Heightened morale in your company will lead to employees that do more and stick around longer. > Download a free guide to using texting for employee communication.